If you have any questions about the PROJECT CASTOR information page below please contact us. 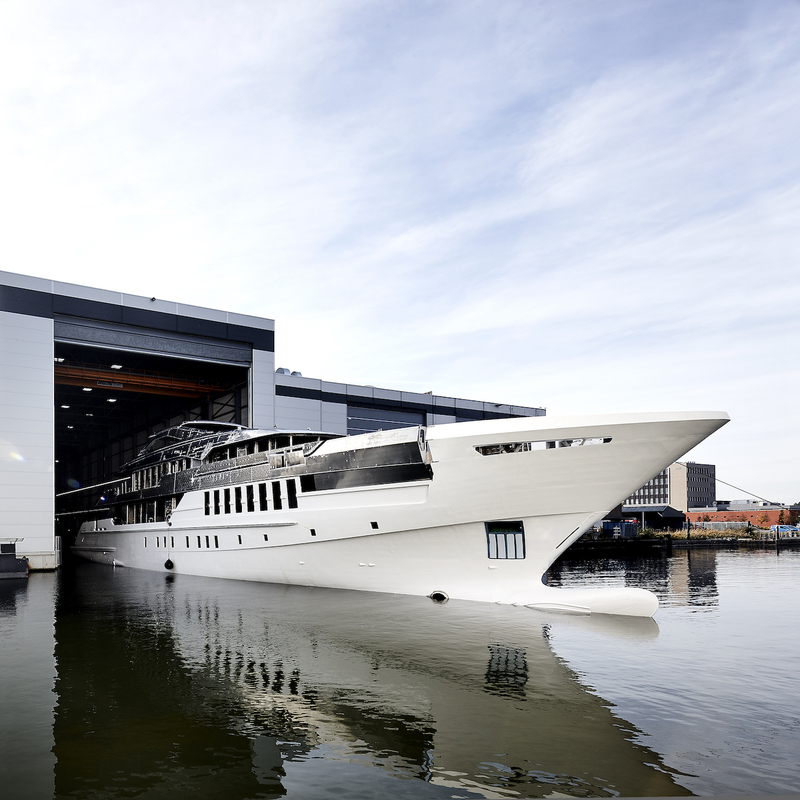 Luxury superyacht Project CASTOR is built by the Dutch shipyard Heesen Yachts with a delivery date in spring 2020. 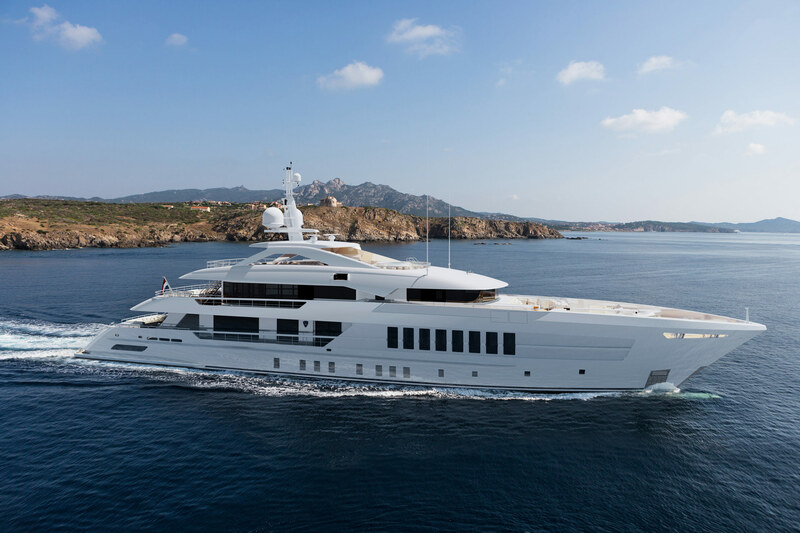 This 55m (180’) motor yacht features exterior design by Omega Architects while her elegant interiors were designed by Bannenberg & Rowell, accommodating up to twelve guests in six staterooms. The lower deck transom door folds down to make a large swim platform into the beach club, where a port interior staircase leads up to the main deck aft. The stern is lined with a C-shaped sofa around two coffee tables with aft-facing additional seating that can be moved as desired. Side walkways lead past the main salon and formal dining area with forward staircases leading up to the foredeck, where there is another C-shaped forward facing sofa and two drinks tables for the group to gather and take in the uninterrupted forward views. The bow is used to store the tenders and a Davit crane between them allows for easy launch and retrieval. The upper deck aft hosts the first of two alfresco dining tables and seats up to 10 guests in the shade with panoramic aft views. Two sofas along the stern and one to port placed beside two coffee tables creates an outdoor lounge for guests to remain outside after a meal. The starboard upper deck aft has staircases leading down to the main deck and up to the sundeck, where a row of sun loungers covered the aft and and the shaded central section contains the second and larger alfresco dining option, seating 12 guests. A sofa is placed to port with a curving wet bar placed between the dining area and the massive forward Jacuzzi flanked on either side by sunbeds. The interiors created by famous British design duo Bannenberg & Rowell make use of neutral tones to create a tranquil environment boasting smoked oak chevron parquet flooring in combination with Calcutta and Pietra Grey marbles. 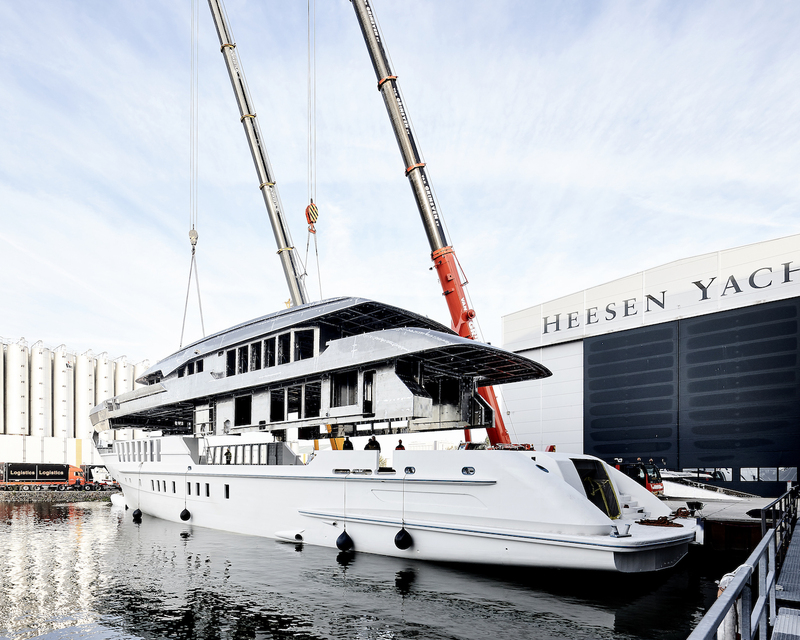 The lower deck stern is fitted with a massive beach club that can also be used as a gym, with sun loungers placed forward close to the transom door that becomes a swim platform and workout equipment is placed forward. A steam room is placed to port along with a shower and changing room for convenience after a swim in the sea. 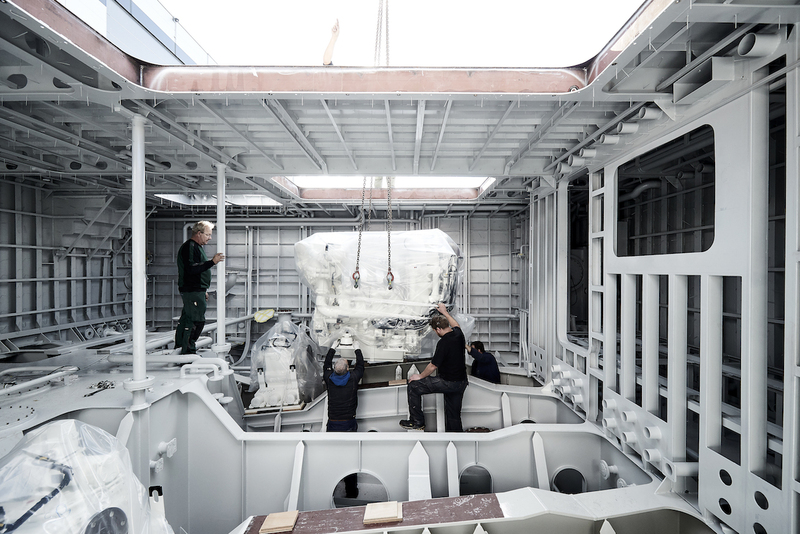 The engine room is placed forward of the beach club, followed by the guest accommodation and then the crew accommodation, mess and services taking up the forward section of the lower deck. The main deck aft provides a large open plan lounge that places the formal dining area forward for convenient and discreet access to the crew corridors and galley. The salon consists of two plush sofas and armchairs with coffee tables for a comfortable and functional social setting, with the entire room benefiting from floor-to-ceiling windows and glass sliding doors both sides of the dining table for a closer connection to the outdoors. Amidships to starboard is the main foyer, while the port-section is dedicated to the crew corridors and galley. 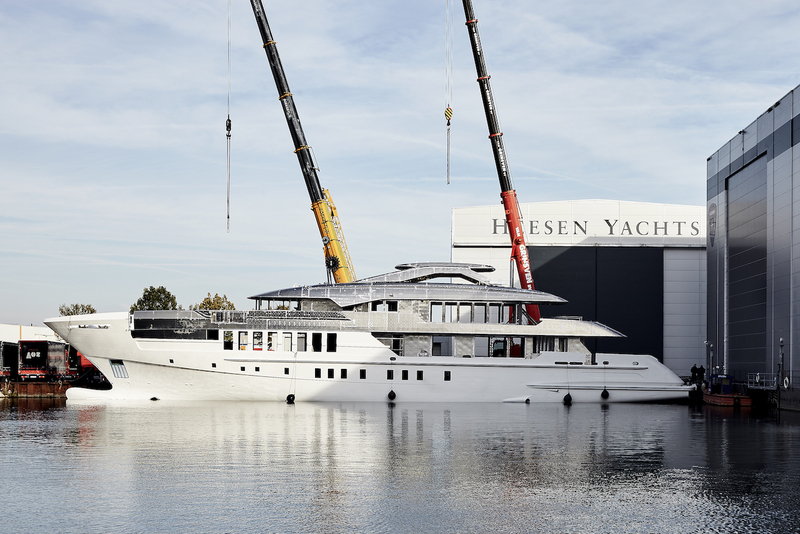 The full-beam Master suite is placed on the main deck forward. The helm station is placed forward on the upper deck with the Captain's cabin and VIP stateroom immediately behind. The sky lounge to the aft continues the cool and calm theme found in the main salon, and the interior also makes use of floor-to-ceiling windows for a light-filled environment. The port side of the room is furnished with a wet bar and four stools, while to starboard there are two sofas and armchairs placed around a coffee table ideally situated for excellent views and an easy connection with the alfresco dining area on the main deck aft. 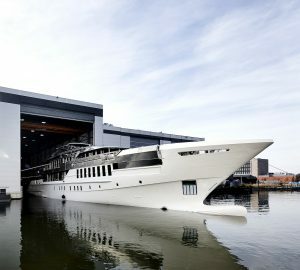 The engines provide a maximum speed of 15.5 knots and a cruising speed of 14 knots, at which PROJECT CASTOR has an impressive range of 4,500 nautical miles. The accommodation sleeps a maximum of 12 guests across 6 spacious en-suite staterooms: 1 Master suite, 1 VIP stateroom, 2 double cabins and 2 twin cabins. ~ The full-beam Master suite is located on the main deck forward and has a private office leading through to the master bedroom, which has an additional desk near the port windows and to starboard a lounge consisting of two armchairs and a drinks table. The forward bathroom is accessed via his and hers walk-in wardrobes to either side, with the central area furnished with two sinks, a bathtub, a port toilet and starboard shower. ~ The VIP stateroom enjoys elevated views on the upper deck and contains a desk and large bathroom. ~ The lower deck hosts the rest of the guest accommodation, consisting of two generous double cabins and two twin cabins, all with desks and en-suite facilities providing a toilet, double sink and shower. 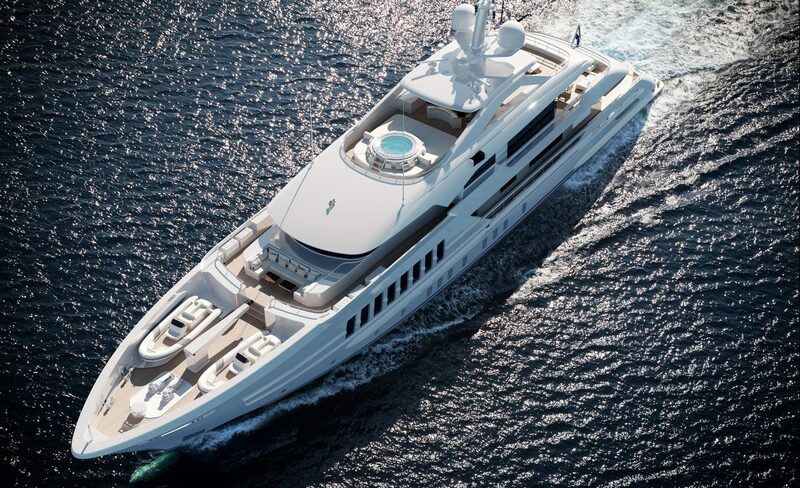 We do have available further amenity, owner and price information for the 55m (180') yacht PROJECT CASTOR , so please enquire for more information. The luxury yacht PROJECT CASTOR displayed on this page is merely informational and she is not necessarily available for yacht charter or for sale, nor is she represented or marketed in anyway by CharterWorld. This web page and the superyacht information contained herein is not contractual. All yacht specifications and informations are displayed in good faith but CharterWorld does not warrant or assume any legal liability or responsibility for the current accuracy, completeness, validity, or usefulness of any superyacht information and/or images displayed. All boat information is subject to change without prior notice and may not be current.